Valley Workshop was established by father and daughter team, Warren French and Penelope Haley. We offer an integrated approach to design and construction that considers, operational and embodied energy of a building and its components, light, space and consumer well being. Through careful consideration of these elements negative impacts on the environment caused by construction is being reduced. Low carbon, low impact, high happiness. Valley Workshop’s philosophy is to build homes that are efficiently built, where the materials used are sourced from local suppliers and the finished product is a light filled aesthetically pleasing home that enriches the lives of the occupants. Valley Workshop focus is to create beautiful buildings through the seamless integration of architecture and high performance thermally efficient engineering. The values of collaboration, innovation and quality are central to Valley Workshop relationships with its clients and their project requirements. Valley Workshop - Design is in everything we do. We carefully assess and individually approach the design process for each project. We collaborate with our clients to discover their requirements, analyse the site and develop an optimum design response to the project. Our flat packed and structurally insulated panel construction systems have been developed to allow us to explore endless design possibilities in the delivery of prefabricated building outcomes. Warren is the principal architect at Valley Workshop and is a registered architect and builder. 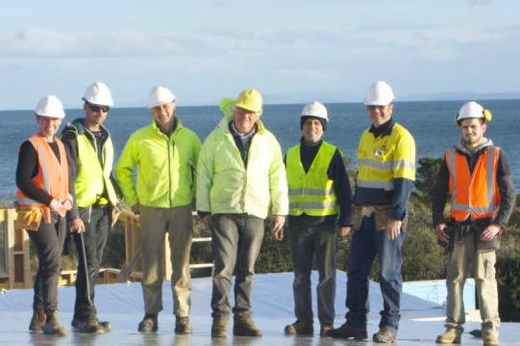 A keen interest in progressing Australia’s building industry to have a more sustainable approach to building and include systems modelled on the likes of building in the northern hemisphere. Warren has 30 years experience in the design and delivery of residential, commercial, development projects in Australia. Penelope is Director of Valley Workshop with qualifications in education and building. She is experienced in the client side project manager with several years of experience in the planning and delivery of residential projects in Tasmania. Penelope has an appreciation for contemporary design, sustainability and lightly constructed housing in Australia. Penelope works onsite along side her team for every project. Charles has been with Valley Workshop since 2014 and works in the workshop. Charles brings a wealth of experience that only the years can offer. Alistair is our second year mature age apprentice. Alistair has fantastic work ethic and commitment to every project. He and is a very valued member of the team. Jesse is our 4th year apprentice and has been with us since 2014. Jesse is a master in the workshop and has an eye for detail and is quick to comprehend complex structures. Justin is an experienced carpenter with decades of experience in the building industry in Tasmania and Western Australia. Justin specialises in form work and concreting. Kayden is our first year apprentice and was employed by Valley Workshop in the summer due to the growth in the company. Kayden has the attitude to become a fine carpenter. Sallie is our office manager and is across accounting systems and regulations relating to business operations. Sallie has been with Valley Workshop since it’s incorporation in 2013. For projects we grow our team. The more the merrier!